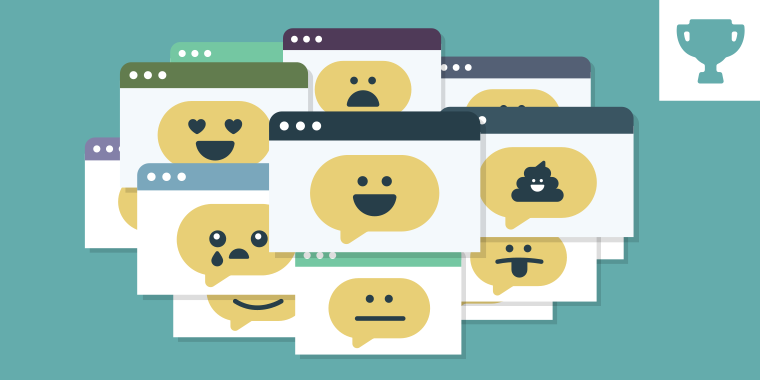 How Do You Show Conversations in E-Learning? One of the most common interactions in e-learning is the scenario interaction where two (or more) characters are engaged in a conversation. The characters are placed together on the slide and speech balloons are used to indicate what each character is saying. But speech balloons are only one way designers can show speech and verbal communication. What are some other ways? That’s what you’ll answer in this week’s challenge! To get help you get started, I’ve rounded up a few community examples that feature creative ways to show dialogue. There’s no better guide to understanding speech balloons than Comic Book Grammar & Tradition by Nate Piekos. 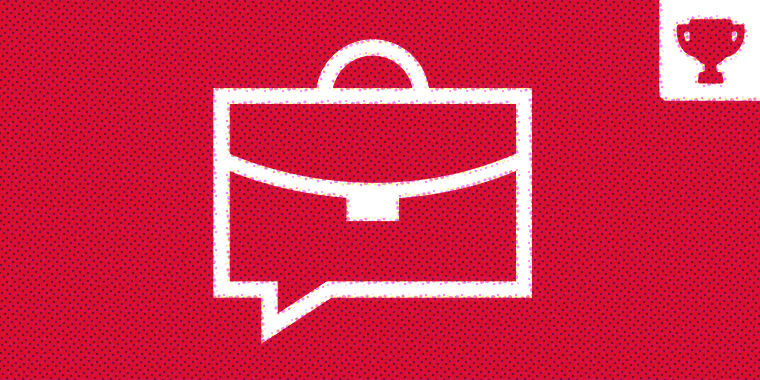 You’ll find a list of every type of speech balloons and when you should use them. If you’re building e-learning scenarios, you’ll want to bookmark this article. 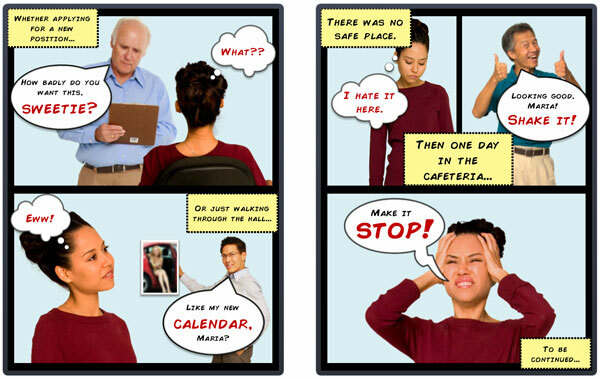 Speech balloons don’t have to be used with comic or illustrated characters. I like the way this example combines comic style panels and speech balloons with photographic characters. In this example, users control the pacing of the conversation by clicking characters to advance from question to answer. The overlapping speech balloons help learners focus on each character’s words. Typically used in journalism, pull quotes are graphic elements that are used to highlight an excerpt or key phrase from an article. This type of approach also works well for showing on-slide speech. Simulating instant messages on mobile phones is another way to show digital communication. If you’ve ever watched BBC's Sherlock or House of Cards, you’ve likely noticed the innovative ways filmmakers are depicting on-screen text messages. 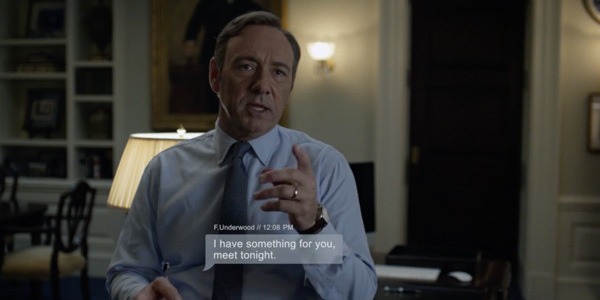 House of Cards uses animated chat boxes layered over live action footage. This enables viewers to remain in the scene with the actor while the text messages are displayed. 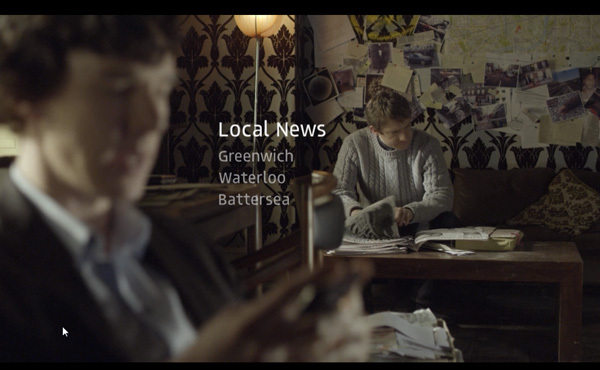 Sherlock takes a more simplistic approach by using floating words without the bubbles around the text. This prevents the graphic elements from appearing outdated as text messaging styles change. You can learn more about the ways filmmakers are experimenting with text messaging styles in A Brief Look at Texting and the Internet in Film. 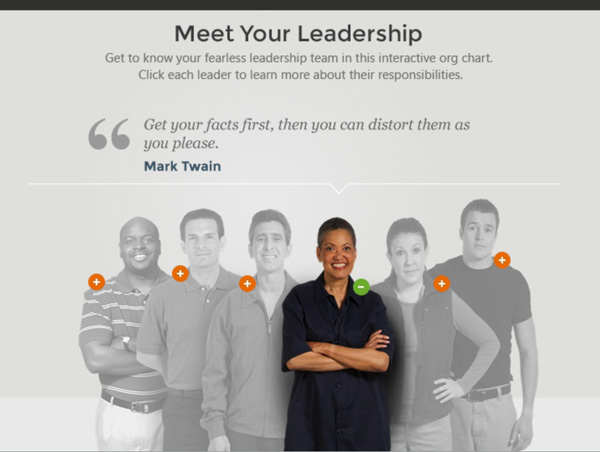 This week your challenge is to show how dialogue can be shown in e-learning courses. You can focus on talking, texting, instant messaging, video chats, or any other form of communication. Your projects can be static or interactive and you can build your demos with any authoring tool. 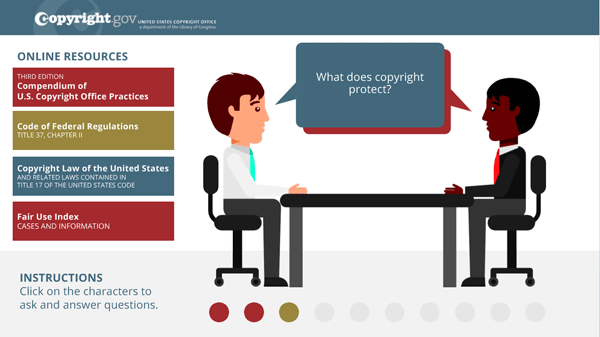 We just want to see your creative solutions for showing dialogue in e-learning. When do you use Speech Bubbles? Wishing you a chat-tastic week, E-Learning Heroes! I saw the title of this challenge and thought "Maybe I could use my comic book harassment demo!" - but you beat me to it. (Thank you!) Great challenge idea - lots of creative options. Glad to hear I can still get the draw on ol' Jackie once in a while. It doesn't happen often! Agree with Alexander, great work. Great example Nancy.... I really like the design and variation of txt and voice over. This one looks great, Nancy! I love the graphics. The audio work is well done, too! Awesome Work! Is it possible if I can get the Story file? Hi Mohamand, this was an excerpt from a project I did for one of my clients so to make a long story short I can't share the Storyline file. I would be happy to answer any questions you have about how it was done. Thanks Nancy for your reply. I can understand, the only thing i want to see is how to scroll the content. In some of the slides, you used the scroll bar. I know there is a feature in AS2 but don't know how to apply in existing scenario? I just used the standard scrolling text panel. To get it to work, insert a scrolling text panel on your slide and then drag the text box onto the scrolling panel to connect the text to the panel. You will know it is connected when the scrollbar appears. It can be hard to make the connection so just keep moving the textbox over the scrolling panel until it connects.The textbox has to be wider than the scrolling panel in order to get it to work. I remember this one Alex, nice. Well done Alex. I like the arrow interaction a lot. Does anyone really want tickets for the Leafs? - bahaha! Nice sample Nancy. Apparently they still do that's why the Leafs never have to bother building a winning team. This is a great example. I love how the objectives of the course were presented as part of the exercise! Love this so much Linda. Did you use After Effects on the videos? No, it's actually done with Photoshop. Ah, so you're the genius behind this! A client showed me this as a stellar example of what Storyline could do! (I'm not sure where he got it...) Very impressive! Thanks for sharing it with us! Thanks Jane, nice to know that some people have found it. Very well done Linda! Great effects and smooth flow. Yeah, this is an amazing piece of work! Thank you Alex, Mohammad, Jeff and Paul! This one is awesome, Linda! Thanks Rachel, I like what you've done with your talking shoes! This is amazing. How did you animate the people in that filtered effect? Is it a video that you edited? Thanks Dana. It is a video that I applied filters to in Photoshop. Okay so the main demo is a great use of chat boxes for conversations. I couldn't help but think the final screen, the one with the shoe and chat box, would also make a great effect for conversations. Instead of the people talking, the shoes could be anthropomorphized to teach learners about the feet types each shoe model most appreciates. Oh my gosh, Dave, I didn't even think about talking shoes! That'd be so much fun! I'll have to try that out. Thank you! Right on! I think it could be really fun and even effective. If you were a shoe, which foot would you most like to spend the day with LOL. Or shoe speed dating where the shoes have to interview feet. Oh boy. I want to work on your next project! Hi Rachel, I think this is great as is. If I could make one suggestion it would be to slow down the speech bubbles a bit. I don't know if I am a slow reader or if my old eyes are slower to adjust but the bubbles disappeared before I could read them. Maybe you could have the learner trigger the bubbles somehow so that they could set their own pace. Thank you I had a great time at the workshop. Really fun, Mark! Well done. i'm calling this the paranize effect, cool work Mark. I really like this one Mark. I am definitely going to use this technique in a project. I like the way you had the left and right swiping. Very effective! Wow, that's a great effect Mark! great job mark. can you share the story file. I know how to get the effect in photoshop, just wanted to see how you did it in story file. did you use motion paths? Tracy, I really like the look of this course. The colours and logo add a lot to your theme. Just one thought, in the slide where you show all of the restaurant staff, it looks like they are floating. I would either show them only from the calf up, or put in a transparent, black shadow, the width of their body, under their feet. You could have always given them a Red Bull :D It looks great now! It's a great concept to explore, I like the flow of it. Love that interaction style. Easily done in Storyline or Studio as well. I really like how the selected answer moves to the top of the screen and the response get's shown below. The 'happy-o-meter' is a great addition. Nice Jane. This looks like a BranchTrack interaction. I am developing a course in the same style. I hadn't read your blog when I made the above comment. I was inspired by Cathy's work as well. I really like this, Jane! I had never heard of BranchTrack--it looks like a cool tool. I love how the immediate feedback is handled! I completely agree with David! Using characters in the course talking with each other is one of the most common scenario use in E-learning course. I think the conversation itself makes people more engage, doesn't matter if it's relevant or not. Keeping eye on that I also have designed a quick course on communication skills. In this course, I used different modes of communication like: Telephone, email and SMS. I believe, using these modes will help this course become more engaging and interactive. Here is my submission: http://bit.ly/1GJoDKe Blog post: https://blendtolearnlms.wordpress.com/e-learning/ Love to see your valuable feedback. This is a nice approach Mohammad, it might pay out to let the user control the dialogue by clicking on each character. I feel the call outs are too close together on the timeline. Thanks for your input. The purpose of getting them too close is to show entire conversation on one slide. So, those readers who read slow can catch up. You are more than welcome to suggest any other workaround you think will work in this scenario? OK, that gives it a bit of more context. I was envisioning a click and reveal workflow where the user click on one character and get three call outs appear at a time. However, what you explained makes sense. Mohammad, I like your interaction. Perhaps, if the learner could control the pace of the phone conversation, it would be easier to follow. I found that I was starting to read each caption, when the next one would come up, that was a little distracting for me. Freebies are always appreciated, Jeff! 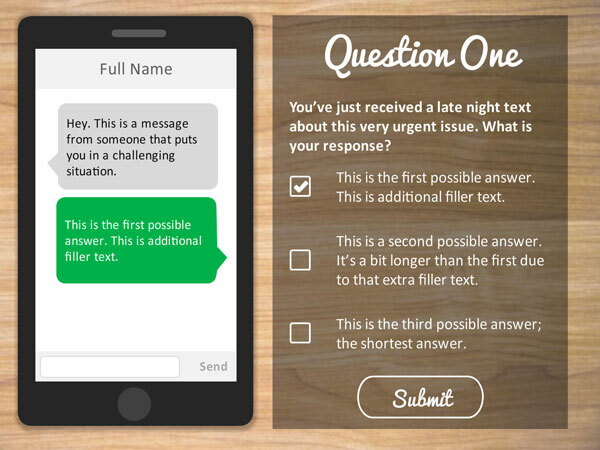 @Jane: I created a reusable Storyline conversation template that works similar. I did it for a workshop. I need to do a write up and share the template. Ok, I built this in two hours: http://bit.ly/1Q4OJdc It's more like a first person scenario. Alex, I really like how you 'built' the world. Stepping out of the elevator, into the corridor, into the waiting room. Simple and effective. Great work! Callouts are best resource for customer support scenarios. Alex, I love all the little extras, the elevator, the buttons and the music. Your work gets better all the time. This one was very engaging, Alex! The pictures and the audio work well together. Also, I really want cupcakes now. That was great. I loved the sounds. Hi Joanne, I tried looking at your sample but got a prompt to log in to Google Drive. You might want to check how you set up your permissions. Hi Nancy, thanks for reminding. I've changed the permission settings, and had asked a friend to try the link. Please let me know if you are still required to log in. Thanks a again. Joanne, I like your idea of dragging the microphone. Great use of states too! Welcome to the challenges, Dustin. Nice entry, I like that way you grayed out the characters after they spoke and added their comments to the board. Nicely done Dustin and welcome to the challenges! Nice example of simulating phone calls. Also liked the way you styled your captions--simple and elegant. Cool example, Paul! I love the animations in this one Paul and like David said, it is simple, yet elegant. Great example, Paul. I like the captions and voice icons synchronised. Background being blurred allows to stay focus on the conversation. Love it! This is well done Paul, I really like the style you've used. This is great Paul. I really like the overall design and the captioning. The design looks great on this one, Paul! I'm very happy that it's captioned, too. My hearing isn't the best, so it's very helpful to have captions with the audio. "Nooooo!!! Not my sister" Nice one, Matt. Stefanie, when I click on the link it's asking if I want to download the file. Yes, I put it in as an Articulate file so if anyone liked it they could use it. Stefanie Stephens Training and Development Consultant Nursing and Allied Health Professional Scholarly Practice 519-685-8500 x 75353 -------------------------------------------------------------------------------- This information is directed in confidence solely to the person named above and may contain confidential and/or privileged material. This information may not otherwise be distributed, copied or disclosed. If you have received this e-mail in error, please notify the sender immediately via a return e-mail and destroy original message. Thank you for your cooperation. OH that's so much fun, Rachel! Nicely done. What a great concept for introducing the history of popular shoe models. You should know that I added Anthropomorphic Characters to the challenge calendar for 11/20. I'll definitely reference your shoe-tastic example! Recap updated to include your latest entry! This gives new meaning to the idiom "My dogs are barking." Ha ha ha indeed! Barking and talking. Here is a small simple history assessment I tried to create. I have tried to imagine history as if it was happening in front of our eyes . Have a look and mail your comments. http://s3.amazonaws.com/tempshare-stage.storyline.articulate.com/stp1a3fh7ki61ifj1b9118dtn6n1mn04/story.html Thanks for your time. Vidya, I loved that you used Social media and Web elements in a story from the 1600s. I like the visuals and layout, and your scenario is well written. The animation felt a little slow though, especially after the first few times. I felt like I was waiting for it because I was already done reading. It's all very smooth though. Nicely done! Congratulations on your move, Chuck! We've moved a couple times so I know what a time tiger those are. Glad you're settled and finding time for the challenges. Hope your new year's off to a great start!